Having worked with basic visualisation let us explore some of the pre-built fuctionalities in the process component. When a process component is servant for a supervisor, the Supervisor controls the servant by writing to Required (as covered in tutorial 2). Disabled: Out of service. Signal to the supervisor not to use the servant. Auto: Servant is controlled by the supervisor. Invalid: The value of the control state is invalid. 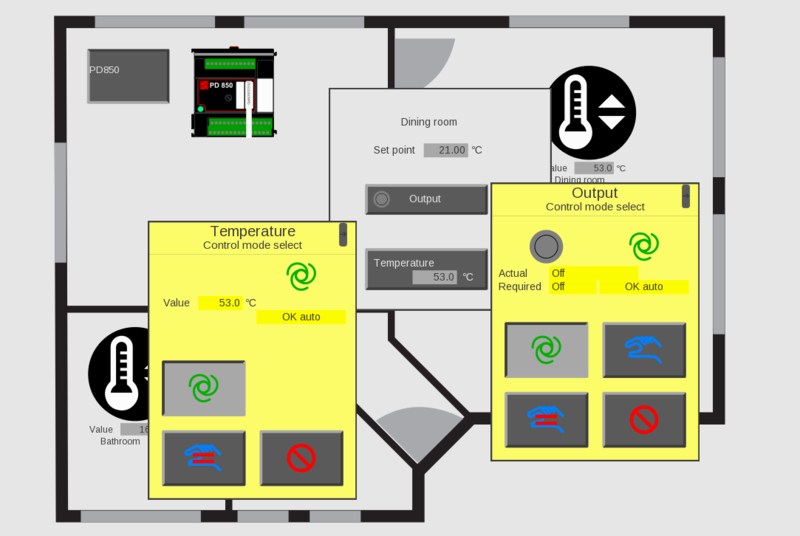 The mode is changed from the visualisation using SET/GET Control_mode. The visualization uses SET/GET Acknowledge_error and SET/GET Restart. 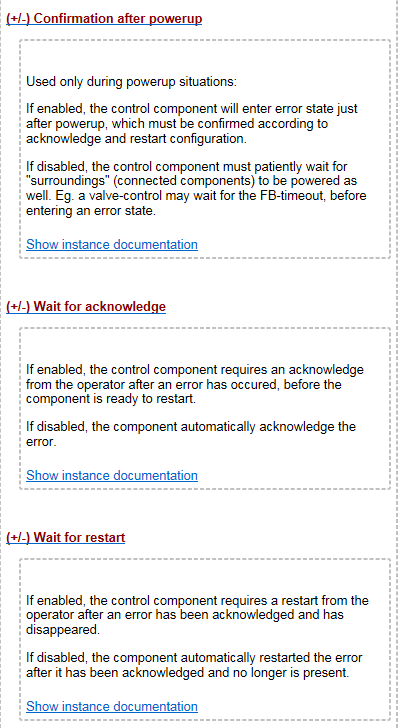 Acknowledge is enabled when the operator must indicate to the system the error is seen. 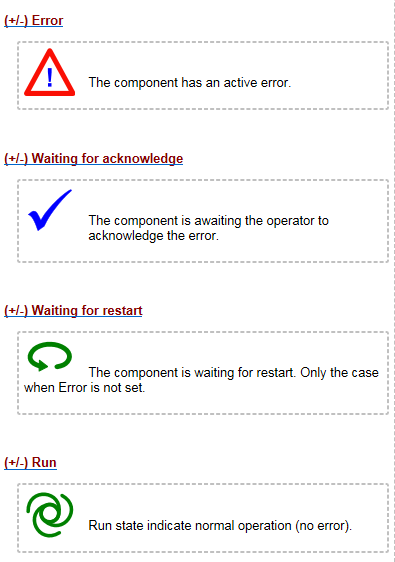 The restart is enabled when starting again need operator supervision. The condition of a component is described in an enumerated variable. This variable is used by the supervisor and the visualisation. The visualisation is able to show enumeration as text and as graphic representation. The ordinal value of the enumeration is used as priority: The highest number is most important. Now let us build the functionality. Step 1: adding a pushbutton for the input and output component. We need to make the window a bit bigger to make room for the two new pushbuttons. Remove the existing view element for the actual temperature "Temperature.Supervisor.Actual_rec.Value"
Right click on view list and add - view for control component - double click on control component "Temperature_input_4_to_20_mA " select view PD_17593- Show_Temperature_input_4_to_20_mA_as_Pushbutton"
Right click on view list and add - view for control component - double click on control component "Digital_1A_DC_output", select view "PD_17610- Show_Digital_1A_DC_output_as_pushbutton"
Launch the graphical editor and move around your components. Step 2: Save, build and run your project. For our next tutorial we will find out how to calculate the condition for our temperature regulator.